Dina Halegoua-De Marzio, MD, is an attending gastroenterologist and transplant hepatologist in practice at Thomas Jefferson University Hospital in Philadelphia, PA. Halegoua-DeMarzio will oversee the Case Conference blog, working with the fellows at Thomas Jefferson for the most interesting and engaging cases of the month. Disclosure: Halegoua-DeMarzio reports she was an consultant for Intercept Pharma. Andy Kistler MD, PharmD, is currently a first year Gastroenterology and Hepatology Fellow at Thomas Jefferson University Hospital in Philadelphia, PA. He received his Doctor of Pharmacy (PharmD) degree from Rutgers University in New Brunswick, NJ. He then earned his MD degree at Rutgers University-New Jersey Medical School in Newark, NJ. He completed his internship and residency in internal medicine at Thomas Jefferson University Hospital. A 57-year-old man with only past medical history of remote subdural hematoma presented to the emergency department after an acute onset of left upper quadrant (LUQ) abdominal pain radiating to his left flank after eating dinner the previous evening. He denied any preceding or current reflux, nausea, vomiting, diarrhea, fevers/chills, dysuria, prior abdominal surgeries or known congenital defects. On exam he was afebrile and vital signs were stable. He did not appear toxic. Physical exam was only pertinent for significant bowel sounds in his left lower chest and mild LUQ and left flank tenderness. His abdomen was soft, non-distended and there was no succussion splash. Initial laboratory studies including complete blood count, comprehensive metabolic panel, lipase and lactate were all within normal limits. 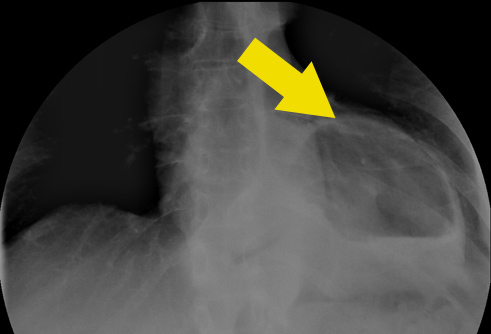 Initial chest radiography showed an intrathoracic gastric bubble (Figure 1). Subsequently, he underwent a computed tomography of his abdomen and pelvis (CT A/P) that showed a mesentero-axial gastric volvulus (Figures 2 and 3) with an associated paraesophageal hernia. There was no evidence of strangulation. Most of the body of his stomach along with the pylorus was intrathoracic. 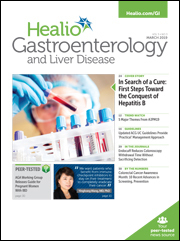 He subsequently underwent an esophagogastroduodenoscopy that showed the paraesophageal hernia and point of rotation without evidence of significant gastritis or Barrett’s esophagus (Figures 4 and 5). Eventually he was taken to the operating room for a laparoscopic Nissen fundoplication and was discharged several days later. Figure 1: Intrathoracic gastric bubble on initial chest xray. Figure 2: Coronal view of CT A/P showing intrathoracic stomach. Figure 3: Sagittal section of CT A/P illustrating intrathoracic stomach. 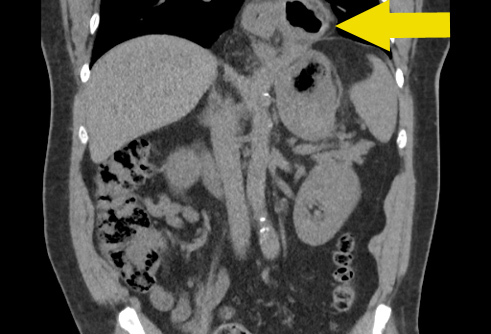 Figure 4: Retroflexed view of the cardia with hernia sac. Figure 5: Endoscopic view at point of rotation of volvulus. Antrum and Pylorus. 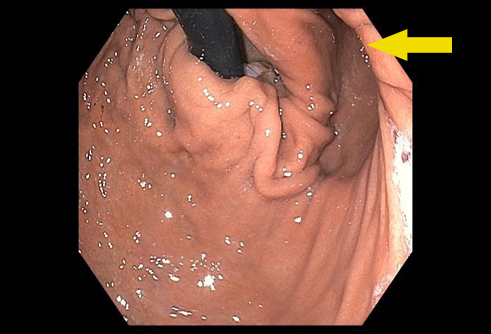 Gastric volvulus is a rare cause of patients presenting with acute or chronic abdominal pain. It occurs when the stomach rotates on either its short or long axis leading to relative gastric outlet obstruction. 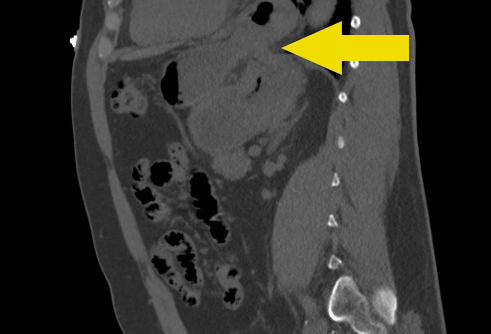 Depending on the degree of rotation, the obstruction can lead to ischemia, necrosis or eventual perforation. Most patients presenting with gastric volvulus will be older than 50 years, have prior history of gastrointestinal anatomic anomalies and/or diaphragmatic or paraesophageal hernias. If not diagnosed early, gastric volvulus has reported mortality rates as high as 50%. Primary gastric volvulus represents approximately one-third of all cases, is usually related to an anatomic problem with the gastric ligaments and typically has a chronic presentation. Secondary gastric volvulus occurs in approximately two-thirds of patients, usually in patients with history of paraesophageal hernias and typically presents acutely. Patients with gastric volvulus can present with either acute or chronic abdominal pain. In addition to abdominal pain, symptoms include chest pain, reflux, nausea/vomiting, hematemesis, dysphagia and bloating. Borchardt’s triad of epigastric abdominal pain, vomiting and inability to pass a nasogastric tube (NGT) occurs in up to 70% of cases and should elevate gastric volvulus towards the top of a differential diagnosis if present. Diagnosis can be made using plain chest and/or abdominal radiography, which can show the gastric bubble within the thoracic cavity. CT of the abdomen and pelvis can also be used to assist in the diagnosis. NGT decompression should be attempted in patients with severe symptoms and suspected gastric volvulus. Basic airway management should be initiated on presentation and may eventually lead to intubation if gastric secretions cannot be controlled with nasogastric decompression. 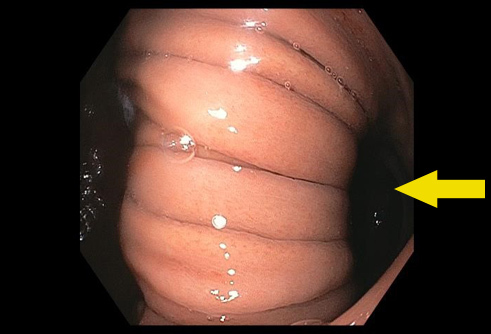 An EGD is sometimes performed in attempts of endoscopically de-rotating the volvulus or to further evaluate the esophageal and gastric mucosa prior to surgical intervention. Surgical techniques used in patients with gastric volvulus include laparoscopic or open reduction and de-rotation of the stomach, partial gastrectomy (if ischemic areas found), repair of hernias and gastric fixation with percutaneous gastrostomy tubes. Our patient’s presentation was interesting for several reasons. Considering he had a relatively large paraesophageal hernia, we expected that he would have complained of reflux symptoms prior to admission, however he denied this. He also denied vomiting and would not have met the criteria for Borchardt’s triad. Although relatively rare, gastric volvulus should be kept on the differential diagnosis for patients presenting with both acute and chronic upper abdominal pain as a delay in diagnosis may lead to increased mortality. Rashid F, et al. Int J Surg. 2010;8(1):18. Wasselle JA, et al. Am J Gastroenterol. 1993;88(10):1780. Chau B, et al. Emerg Med J. 2007 Jun;24(6):446-447.